Schrempp and Eaton celebrate "Day One" on the New York Stock Exchange. April 1995: Kirk Kerkorian, Chrysler Corp.'s largest shareholder, launches a hostile takeover bid, valuing the automaker at $22.8 billion, before withdrawing it seven weeks later. August 1995: Daimler-Benz and Chrysler begin exploring the potential for a joint venture, known as Project Q Star, to expand outside of the U.S. and Europe, but they abandon the idea in early 1997. 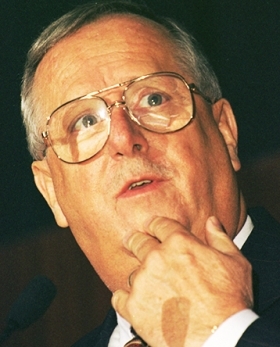 September 1997: Daimler Chairman Juergen Schrempp raises the possibility of a merger with Chrysler Vice Chairman Bob Lutz during a dinner at the Frankfurt auto show. December 1997: Tom Stallkamp, left, is named president of Chrysler. January 1998: Schrempp meets with Chrysler Chairman Bob Eaton at Chrysler headquarters during the Detroit auto show to suggest a merger. "I have come to the conclusion that if we get together we will really fit perfectly well," Schrempp tells Eaton, according to the 2000 book Taken for a Ride by Bill Vlasic and Bradley Stertz. "Product, geography, everything fits." He also meets with Ford Motor CEO Alex Trotman at a downtown Detroit hotel later the same day. Shortly afterward, Eaton calls Kerkorian to say he's talking to Daimler and "this looks like it could be a good marriage. There are a lot of pluses." Later in January, Eaton calls Schrempp to say, "Juergen, I think this is a good idea. We should talk." February 1998: Eaton advises the Chrysler board that he has had discussions with Daimler, and the board agrees to keep talking. Eaton and Chrysler CFO Gary Valade fly to Geneva, where Eaton lists two nonnegotiable conditions: Any deal has to be a merger of equals, and Chrysler shareholders must receive a premium over the current stock value. "Of course we will be equals," Schrempp says. Negotiations begin in Manhattan. Chrysler officials identify $1 billion in possible cost cuts as part of a merger. The companies agree to hire law firms to work on the deal and use the code-name Project Gamma, referring to Chrysler as "Cleveland" and Daimler as "Denver." 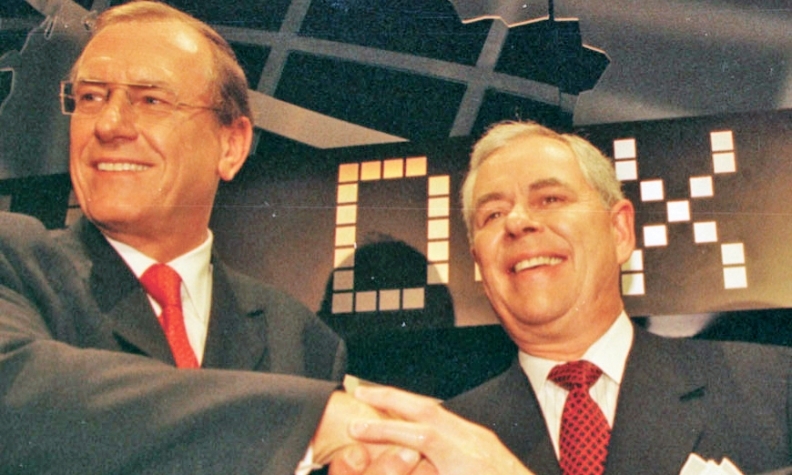 March 1998: Eaton and Valade meet with Schrempp and Daimler executive Eckhard Cordes during the Geneva auto show. Eaton agrees to incorporate the merged company in Germany and, in exchange, suggests the name ChryslerDaimler-Benz, which Schrempp says he will consider. They agree to have dual headquarters in Stuttgart and Auburn Hills, Mich., and Eaton says he will step down within three years after the merger is completed. Chrysler executives go to London for a meeting with Daimler executives to share product plans and discuss a valuation for Chrysler. April 1998: Chrysler's board considers the proposed merger. At a meeting in London, Eaton threatens to call the deal off unless Daimler agrees to a larger valuation for Chrysler than Schrempp has proposed. Eaton and Schrempp strike a deal in principle to give Chrysler shareholders a 28 percent premium. Daimler Supervisory Board Chairman Hilmar Kopper signs off on the deal. Trotman tells Schrempp that the Ford family won't support a merger with Daimler and suggests that Chrysler "would be the perfect fit for you." Schrempp and Eaton set early May as the time frame to announce the merger, and Eaton chooses Stallkamp to be president of the new company. May 3, 1998: The Daimler Board of Management meets for final deliberations on the merger. Eaton threatens to call off the merger again over unresolved issues raised by Daimler. May 5, 1998: Chrysler executives agree to the name "DaimlerChrysler" after Schrempp threatens to call the deal off. Chrysler's board unanimously approves the deal. May 6, 1998: Chrysler confirms talks with Daimler-Benz after a Wall Street Journal report about the potential merger. Deutsche Bank, Daimler's largest shareholder, agrees to support the deal. Kerkorian signs a letter in support of the merger. Chrysler and Daimler sign the $36 billion merger agreement in London. May 7, 1998: The companies announce at 7 a.m. London time (2 a.m. in Detroit) that they have agreed "to form the leading global automotive company." The news release says no plant closures or layoffs are planned and, in the opening paragraph, declares the transaction to be "a merger of equals" between "two of the world's most profitable car manufacturers." The new company would have 442,000 employees and a market cap of nearly $100 billion. May 9, 1998: At a press conference, Eaton says, "This is a merger of equals. That's the way the company will be run." May 14, 1998: The Daimler-Benz Supervisory Board agrees to the merger. June 1998: Daimler's management team visits Auburn Hills, and the Chrysler management team visits Stuttgart a week later. July 1998: Lutz retires from Chrysler. August 1998: The 18 executives who will be members of DaimlerChrysler's new management board meet at the Greenbrier resort in West Virginia to finalize merger details. September 1998: Chrysler shareholders approve the merger with 97.5 percent approval. Daimler-Benz shareholders give the merger 99.9 percent approval. November 1998: "Day One": DaimlerChrysler stock begins trading on Nov. 17 under the ticker symbol DCX. December 1998: Dennis Pawley, left, head of manufacturing, becomes the first Chrysler executive to step down after the merger. September 1999: Eaton fires Stallkamp as president. Stallkamp is replaced the next month by Chrysler sales boss Jim Holden. Juergen Hubbert, the No. 2 German executive at DaimlerChrysler, says in an interview that Stuttgart will ultimately be the sole headquarters, because it is a German company. 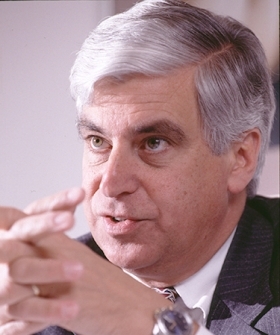 January 2000: Eaton announces his retirement as co-chairman of DaimlerChrysler. March 2000: DaimlerChrysler agrees to buy a 33.4 percent stake in Mitsubishi Motors Corp.
June 2000: DaimlerChrysler says it will pay $428 million for a 10 percent stake in Hyundai Motor. September 2000: Chrysler designer Tom Gale announces his retirement at the Paris auto show. He says, "By and large, I think we've made it work OK, I suppose. Time will tell. It's not for the lack of people having good intentions. There's no smoking gun." October 2000: Schrempp tells the Financial Times of London that the deal with Chrysler was always envisioned as a takeover and not a "merger of equals," saying that he had portrayed it as such "for psychological reasons" to get Chrysler executives on board. November 2000: DaimlerChrysler fires Holden, bringing in Dieter Zetsche as Chrysler's CEO and Wolfgang Bernhard as COO. Kerkorian sues DaimlerChrysler and Schrempp for $9 billion, accusing them of fraud. January 2001: Chrysler announces 26,000 job cuts and six plant closures in North America. February 2001: Eaton tells Automotive News that he never attempted to deceive anyone about the merger. "I believed from the bottom of my heart that this was a merger of equals," Eaton says, "and I believed that the combined company would be the strongest automotive company in the world." April 2005: Kerkorian loses his fraud lawsuit. January 2006: Zetsche succeeds Schrempp as chairman of DaimlerChrysler. February 2007: Chrysler announces 13,000 job cuts as part of a restructuring, and DaimlerChrysler says all options for Chrysler are being considered, including a sale. May 2007: DaimlerChrysler sells 80.1 percent of Chrysler to Cerberus Capital Management for $7.4 billion, with most of the money going back into Chrysler, and says it will become known as Daimler AG. April 2009: Daimler sells its remaining 19.9 percent stake in Chrysler.